When I start a painting I generally look for the largest and simplest washes first. Here I have used French Ultramarine Blue and created a flat wash in some of the areas where the sky shows through behind the plant. Mix up a puddle of pigment and water and test it on a scrap piece of watercolor paper to see if your mixture will provide the correct value. I like to use a value chart number 1 through 6 to help me define and establish the values in a painting - the lights and darks. I really believe that if you have a nice composition and a good range in values you will have a successful painting. 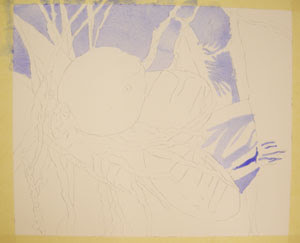 Use some of the French Ultramarine puddle to glaze in the shadow area of the tree trunk at right also.